Financial markets remain sceptical over the Federal Reserve's predictions for the path of monetary policy. Uncertainty over whether Janet Yellen will remain the Chair, low inflation and some concerns about a potential government shutdown in December goes some way to explaining this. However, with Fed officials broadening out the factors justifying tighter monetary policy, such as financial stability and financial conditions, and with growth looking strong and inflation edging higher, we think a December rate hike looks probable. We are a little more cautious in 2018, predicting two 25bp hikes versus the Fed’s forecast of three.This reflects our belief that a steeper yield curve caused by the Fed’s balance sheet shrinkage programme and ECB tapering at the margin will reduce the need for action at the short-end of the curve. With all of this in mind, here's what the Fed will be looking at as it meets next week. The domestic economy is looking strong with business surveys at 10-year+ highs, unemployment at 16-year lows, confidence strong and asset prices continuing to rise. Hurricane effects appear to have been limited, and recovery efforts could support growth in coming quarters, while a strengthening global economy offers further encouragement. With 3Q GDP growth coming in at 3%, there is the potential for the Fed to upgrade its view that economic activity has been “rising moderately”. The strength in activity means jobs continue to be created in significant numbers, driving down the unemployment rate. This is creating skills shortages in several sectors. Encouragingly, we may finally be seeing signs that wage growth is picking up. Having undershot expectations for much of this year, we are finally seeing evidence that inflation is turning a corner. Fuel and commodity prices are contributors while the PPI report suggests pipeline pressures are rising, boosted by the dollar’s decline this year. With wages rising we could see inflation receiving more upside momentum, particularly in an environment of high domestic demand. There is increasing confidence that President Trump will get some form of tax reform this year or in early 2018, which should provide an additional boost to what is already a very positive growth story. The prospect of significant infrastructure investment looks much more distant. Fed officials are forecasting a December hike with three more next year. 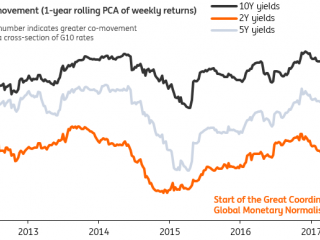 They cite not only healthy growth and the prospect of inflation returning to target but also reasonably loose financial conditions (flat yield curve and weaker dollar), “somewhat rich” asset valuations and concern over financial stability – prolonged low-interest rates encouraging “risky” lending. We suspect Trump is likely to re-nominate Janet Yellen as Fed chair or promote Jerome Powell rather than install an external official, which would leave the Fed’s stance unchanged.